Kim Stanley Robinson imagines an alternate history of the last seven hundred years.It is the fourteenth century and one of the most apocalyptic events in human history is set to occur - the coming of the Black Death. History teaches us that a third of Europe's population was destroyed. But what if? What if the plague killed 99 percent of the population instead? How would the world have changed? This is a look at the history that could have been - a history that stretches across centuries, a history that sees dynasties and nations rise and crumble, a history that spans horrible famine and magnificent innovation. 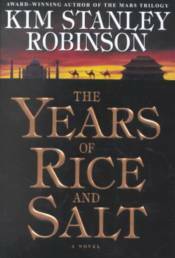 These are the years of rice and salt.This is a universe where the first ship to reach the New World travels across the Pacific Ocean from China and colonization spreads from west to east. This is a universe where the Industrial Revolution is triggered by the world's greatest scientific minds - in India. This is a universe where Buddhism and Islam are the most influential and practiced religions and Christianity is merely a historical footnote.